The Pioneer Nature Trail is a moderate 1.25 mile loop hike located in and along an upland praire draw. Location: Council Grove Lake near Council Grove, Kansas, At Council Grove Lake 1 miles northwest of Council Grove. From Council Grove, Kansas travel north on Mission Street, which becomes the City Lake Road and travel 1 mile. 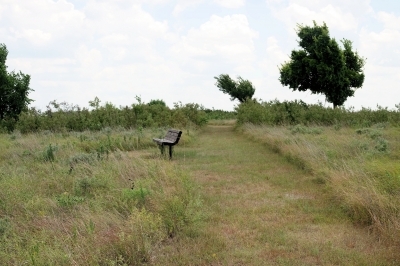 The Pioneer Nature Trail is located behind the US Army, Corps of Engineers Lake Office. The Pioneer Nature Trail is located at Council Grove Lake, which is a 3,310 acre lake owned and managed by the US Army Corps of Engineers. The trail is located three miles northwest of the Historic town of Council Grove, near the Neosho River, which is nestled in the scenic east Kansas prairie known as the Flint Hills. The 1.25 mile long trail offers many wildlife viewing opportunities due to the abundance of wildflowers, butterflies, birds, mammals, and reptiles that make their home along and in the area of the trail. Another very interesting feature along this trail that is explained in more detail by an interpretive wayside sign that is located on the trail is the presence of buffalo wallows. The wallows were created back in the 1800's when millions of buffalo roamed the tall grass prairie region of the United States. Some wallows were 30 feet across and more than 2 feet deep and the remnants of the wallows that remains along the trail still benefit wildlife by providing protection, nesting area to raise young, and a source of water during the rainy season. The trail consists of two loops. 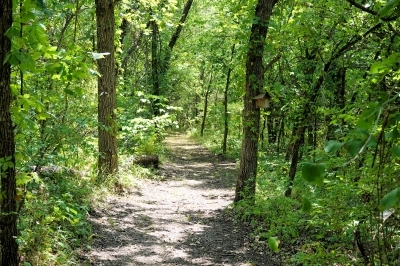 The first trail loop is _ of a mile long and was completed in June 1981 by the US Army Corps of Engineers, Kansas State & Extension Forestry, and Kansas Trails Council. The second trail loop "Buffalo Wallow Loop" is ? 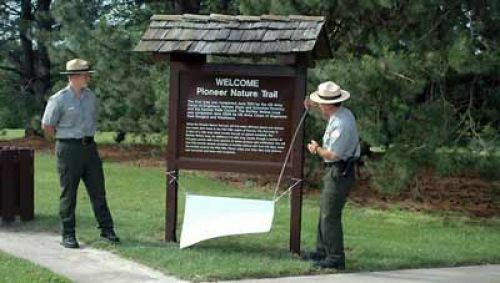 mile long and was completed June 2006 by the US Army Corps of Engineers Park Rangers and Volunteers. The area in which the trail is located is historical and offers many outdoor recreational opportunities. 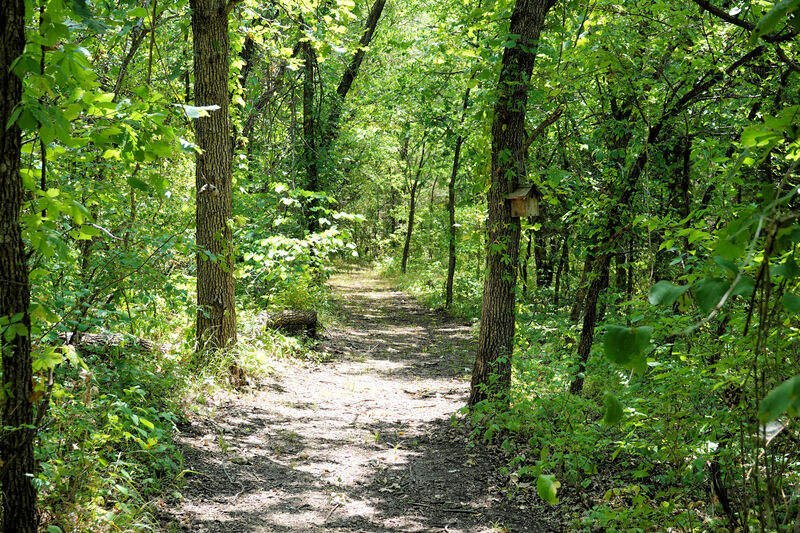 Council Grove offers an authentic old trail town experience at the crossroads of the Santa Fe Trail and Flint Hills National Scenic Byway. A council held in 1825 between the Osage tribe and government agents gave the settlement its name. Ample water and grass and the last stand of hardwood timber between Missouri and Santa Fe helped make Council Grove the pre-eminent rendezvous point for the thousands of wagon trains traveling the Santa Fe Trail. Over twenty-four historic sites are located in Council Grove including the Kaw Mission State Historic Site & Museum and one of twelve Madonna of the Trail Monuments in the United States. Council Grove Lake where the trail is located offers outdoor recreational opportunities such as camping, boating, picnicking, hiking, and fishing to over 375,000 visitors each year. 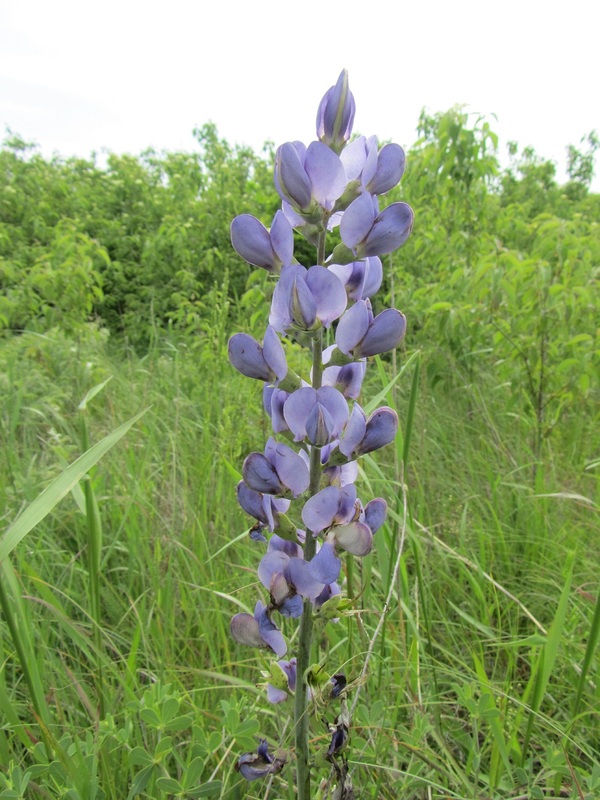 Blue Wild Indigo on Pioneer Nature Trail. Photo by M Alley. 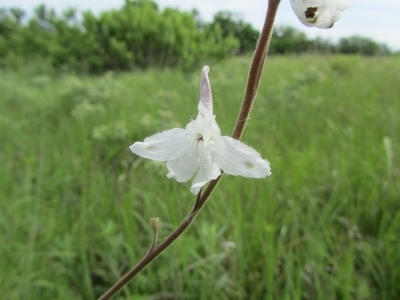 Prairie Larkspur on Pioneer Nature Trail. Photo by Mieko Alley. Pioneer Nature Trail - 7-11-2018. Photo by Jim Walla. The start of this trail is not real obvious from the parking lot, but look for a series of stone markers that take you to an opening in the woods (picture attached). Roughly half of the trail goes through a forest and the other half is out in a tallgrass prairie. Nothing special, but a pleasant walk.